A discussion around new, innovative ways of taking control of customer data to action valuable insight into change. The current business climate is not a particularly friendly one, with retailers closing at an alarming rate, and even big established companies like Apple struggling in comparison to previous years. This climate has given rise to many organisations looking inward, to see if their data can provide the edge they need to get ahead of the competition. With so much information being generated in every area of an organisation, it’s a prudent approach. But harnessing this information to understand the business – and, more importantly its customers, can be a struggle. Data analytics used to be the preserve of data scientists, with little accessibility to those without a data science degree. Even with these academics in place, it was hard to analyse large data sets and it took a long time to get results – not to mention the expense due to the required specialised skills. Due to this difficulty, many businesses fail to make use of their data with many organisations ‘defaulting’ to analysing just a small sample of information – such as sales data – thus cutting themselves off from potentially useful insight. Knowing what data to focus on can be a great challenge. In the past, the focus was on sales data, but as much as the sales team would like you to think otherwise, it doesn’t provide much insight. Far more valuable to an organisation is customer data. However, this has always been seen as hard to access, so is often ignored. Part of the issue is that customer data is stored in multiple locations, which leads to many duplicates. Moreover, even these duplicates are stored in varying formats, creating multiple versions of ‘the truth’ and further complicating analysis. At this point, organisations give up, thinking it’s not worth the effort. However, this couldn’t be further from reality. Customer data can provide much needed insight (which cannot be gained from sales data) and give organisations a real edge vs the competition. This is because it includes information such as how often a customer visits the company’s website, or how long they spend on the phone to customer services, what they purchase, and many of their habits and preferences. By definition, this customer data is disparate; collected by different departments and stored in various ways, but bringing it together for analysis is the key to success. Spending the time to normalise this information can show patterns that would never have been obvious otherwise. For instance, a logistics company could analyse routing to make deliveries and pickups more efficient, or a bank might find it easier to spot fraudulent applications, or a manufacturer could learn that recommendations influence high value transactions more than demos and marketing information. However, organisations can’t just launch into analysing customer data and to try and start generating insights. There are three key elements to success. Firstly, organisations need to know where all their customer data is stored – bringing together the disparate silos within the business and centralising information. It then needs to be cleaned to ensure it is in the best condition position, ensuring that duplicates are removed and that everything is in the same format so that it can be analysed. Processes must then be put in place to ensure that data stored in the future is formatted in the same way to ensure consistency at all times. This can be an arduous process but it’s vital to success, and there are experts who can make this process simpler if organisations don’t have the skills in house. Once this is done, it’s important businesses understand what they want to learn. It might sound simple, but it’s one of the hardest elements to get right – mainly because businesses need the right people to ask the right questions. Rather than just training a few people to work on data analysis, businesses need to put in place wider practices to ingrain knowledge about analytics throughout the organisation. By training people in these areas and providing accessible platforms, organisations can become customer data centric, with a company wide view on what data can be used to achieve. 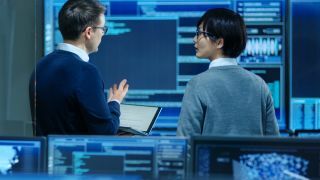 What’s more, when a workforce understands data analysis principles and how to ask the right questions, it doesn’t limit insights to only a select few departments in the business. Lastly, organisations must get the right tools in place to begin analysing their customer data. Previously this was the domain of the data scientist. But thankfully, it isn’t all up to them anymore – which is a bonus, because trained data professionals can be hard to recruit. Data analysis has been made much more accessible through a combination of AI, machine learning and simplified data analytics tools. This assistance means that much of the heavy lifting for employees that want to get answers to their questions can be done without the need for data science qualifications, thus opening it up to anyone within the business. Every organisation should be doing all it can to get ahead of the competition. But all efforts will be hampered if businesses don’t make use of customer data. Unlike sales data, it provides a richer range of insights into consumer behaviour, allowing organisations to improve services and ensure the right things are selling at the right time. The traditional barriers to analytics – such as a high dependence on data scientists and the time required – have been lowered by technology, so there is no reason why organisations shouldn’t be aiming to become more customer data centric.